It takes some work to get WriteLog configured to properly control your station. You’re about to get a lot bigger bang for your WriteLog buck for having invested that configuration. 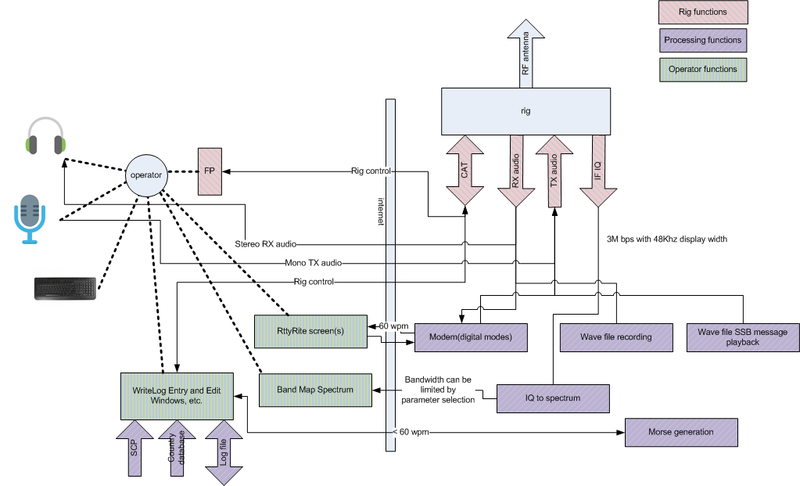 You probably started with getting your rig’s COM port connected so that WriteLog could log QSO frequencies and also command the rig to change bands or go to split. Then maybe you went to SO2R operation and configured an SO2R box to route CW and audio. Then you set up to run digital modes and had some more configuration to get your digital modem to talk to your sound cards. Then there are rotators. WriteLog is releasing an update that provides remote control of itself as a standard feature. What does that mean? Here is a diagram. The divider in the middle of the picture separates your control PC on the left, and your remote PC on the right. That remote PC on the right, however, is nothing new given you have already set up WriteLog at your shack. All those boxes on the right, the rig CAT control and audio, the RTTY modem, SDR IQ generation, SSB wave files and morse generation, are all provided by your usual WriteLog setup at your shack. The new feature is that the WriteLog on the left side of the picture—on a separate PC—operates as a control site. The box in the upper left, labled FP, means you need some sort of radio Front Panel to make effective use of the remote rig(s). WriteLog Remote Control has four different options for this, ranging from the minimum—Entry Window type-in frequency and split commands—to support for manufacturer hardware (the K3/0 for a remote K3.) And WriteLog supports custom USB-based device to be described later. The number of cables you need to move in your shack in order to enable a WriteLog on the internet (or on your local wi-fi network) to control your existing shack with WriteLog is…zero. If you’re not a RTTY operator already, but a CW operator and want to remote control, you’ll need to add a sound device for RX audio. For SSB you’ll also need to add a sound card to drive your TX microphone input. When you get the sound cards for one mode, it works for all modes. Recent rigs like the Elecraft K3S and the Icom-7610 have these device built in already. Just plug their USB ports into your WriteLog PC and it can remote their audio using their built-in support. The number of WriteLog settings you must change is…zero. The number of WriteLog settings you must add is two: a password and a security certificate. When you install the version 12.33 release of WriteLog at your shack, add that password and security certificate and its ready for a control site to connect. Install WriteLog on, say, your laptop PC (we don’t charge you for an extra install, just use your same CALL and registration code) bring up WriteLog using its new Control Site icon. It connects to your shack PC to control it. Your controlling PC will need that password and security certificate from your remote-controlled shack. It will also need a sound device for you to hear receiver audio, and a sound device to send microphone audio to your remote PC. Hint: while laptop built-in sound cards are supported, an external USB sound board with a volume knob will work as an AF gain control. Is your shack setup with two rigs for SO2R? The settings WriteLog remote control requires you to reconfigure to run SO2R from your controlling PC are…none! Shut down WriteLog on the control site, and the remote site WriteLog goes back to normal. There are a lot more details to describe, and a lot more ways you can use this feature. This post won’t try to describe all of them. Use http://writelog.com/categories/remote-controlto browse all the postings on this topic. Two definitions are crucial before the reader goes any further. 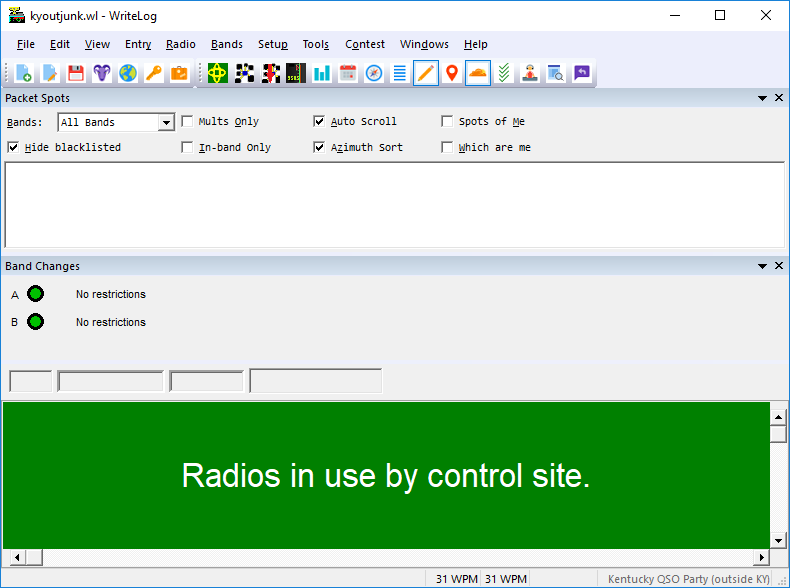 The remote site is the WriteLog that has physical radios that are being controlled by the WriteLog at the control site. While the features in WriteLog Remote Control released in 12.33 are useful, there is work left for us to do to cover every feature you might want for remote control. In a break from our usual practice at WriteLog, we are releasing what we have now knowing its useful, but also knowing its going to generate many more requests for related features. Our first priority going forward, as it always has been for WriteLog releases, will be to fix “bugs.” I put “bugs” in quotes and define the word as a descrepancy between what we have documented the program to do and what it actually does when you run it. The support you might want for a missing feature is not a bug and it will be prioritized lower. Most product announcements only you tell the good stuff and force you to guess what is missing. We prefer to start this discussion with a list of those features that we already know you might want in WriteLog Remote Control that will not be present in its first release. This list does not constitute a commitment to provide such features. Its only a list of things we know about. Rig control is incomplete. This deserves more discussion…but not in this post. WriteLog Remote control doesn’t provide a way to power up or power down your station remotely. WriteLog Remote control doesn’t provide a way to manipulate antenna switches. No CW paddle input at the control site. RX Audio at the remote is sent in stereo for SO2R. Microphone audio at the control site is sent (in mono) to the remote site. SO2R rig support. All radios at the remote are available at the control site. Support for K3 terminal mode at the control site to control a K3 at the remote. RTTY support. All RttyRite windows at the remote site are available at the control site. This includes clone windows. The RX and TX audio for digital modes is not remoted to the control site but is processed exclusively at the remote and the physical radios at the remote. The existing WriteLog Sound Board Mixer setup at the remote specifies the audio devices to be sent to and received from the control site. Any SDR’s you have set up at the remote site are drawn on the Band Maps at the control site. There are no additional configuration parameters. The CW is generated at the remote using whatever WriteLog Setup/Ports specifies for CW generation. Do you run RTTY SO2R on two PC’s? Yes, it works. You’ll need to do some special internet port setup to get a second remote site PC published to connect to, and you’ll need two PCs at the control site—one to connect to each remote site PC.